After a year or longer absence, my Google Places Dashboard has finally reappeared and with data! While all of the above data can be found in the minutia of my site’s Google Analytics account, the Google Places Dashboard provides a quick overview of local search demand for my business in one convenient location. Quite frankly, I was surprised to learn Google sent any clicks to my website at all. 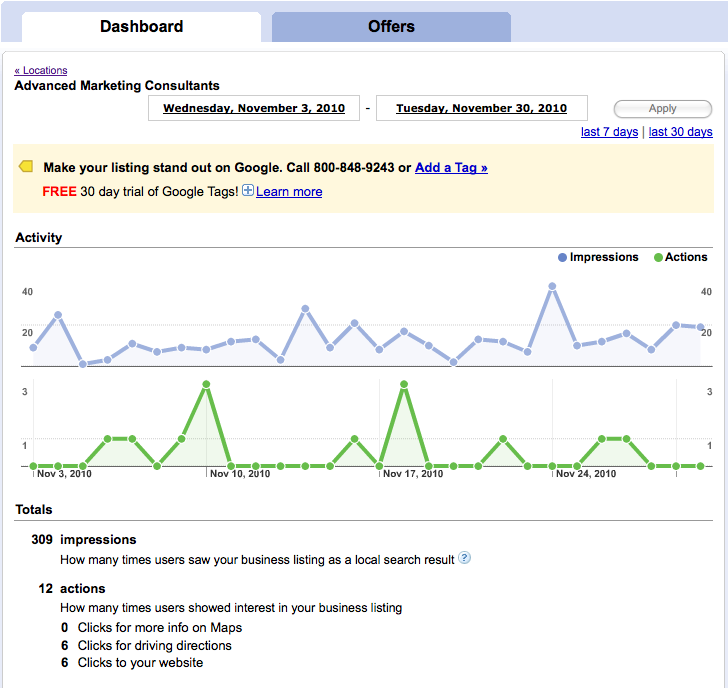 This entry was posted on December 3, 2010 at 4:53 pm and is filed under Google Analytics, Google Places Dashboard, Local Search Demand. You can follow any responses to this entry through the RSS 2.0 feed. You can leave a response, or trackback from your own site.